 For the original review, see here! I’m going to be doing a new series of follow up reviews here on the site that you will continue to see more and more of down the line. I think it’s really important to follow up on reviews, especially the popular ones. Often there’s a “Honeymoon Phase” where there’s excitement for a new pen, and it soon wears off. Please let me know in the comments if there is anything else you would like to know about how the pen is holding up, how much usage it gets, or anything else you may want to know! I have had two Vanishing Points before, and they’re a great versatile pen. 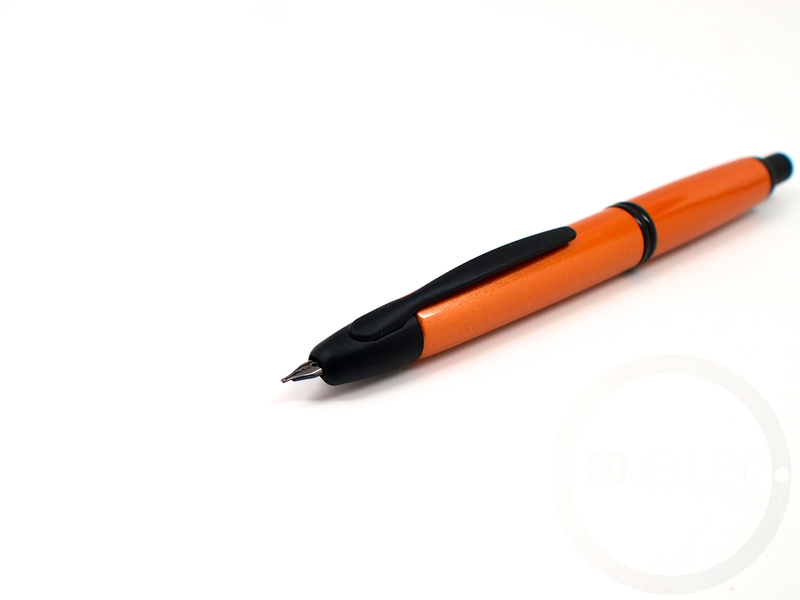 To promote the new range of metallic colors, Deborah over at Pilot graciously sent over a new Vanishing Point in Desert Orange. Thank you Deborah! Instead of simply reviewing the pen again and showing some pictures of the color, I’ve decided to also let you know how my old Vanishing Point is holding up, if any initial praise has worn off, and how much real use mine has gotten. Once again, huge thanks to my friends over at Pilot, and enjoy the update! 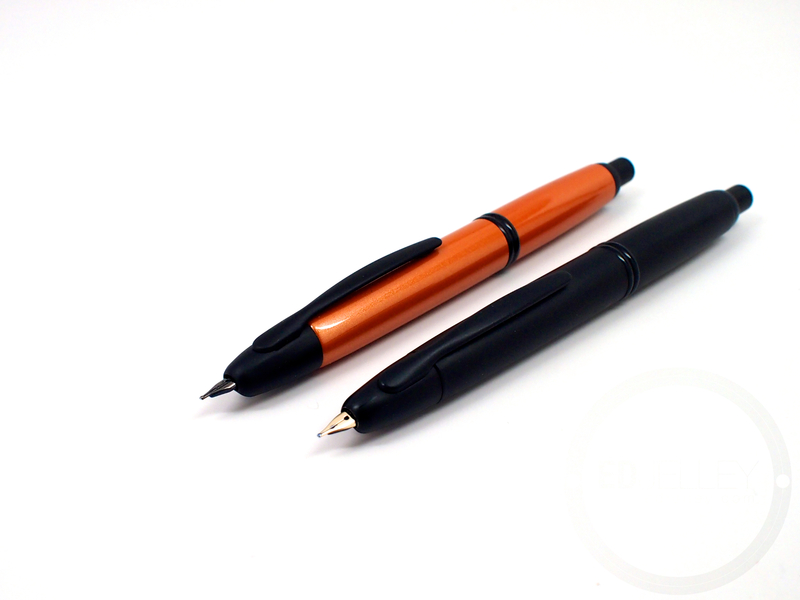 The VP is definitely a durable pen that is meant to be carried and used. I’ve owned the matte black version since June of 2012. The nib (ordered “Binderized” from Richard’s Pens) is still great and buttery smooth. I haven’t used the original fine nib that I purchased the pen with because I wasn’t thrilled with its performance. It was dry and scratchy and just not that pleasant to write with. 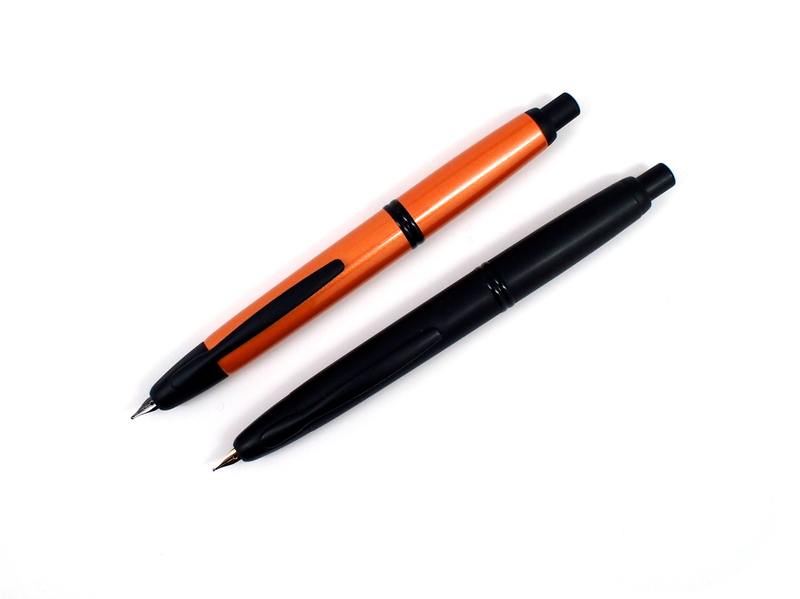 I’m happy to report that the medium nib that Pilot sent with the orange VP is great. No scratchiness, great flow, and it starts up every time. The finish on the matte black version of the pen has started to show some wear. There were complaints about the pens finish chipping away, exposing the brass underneath. Mine’s not thrashed, but I quite like the character that the pen has developed from being carried over time. The new Metallic VP has a clear coat that appears to be much more durable than the matte finish. I had a gun metal grey version of the pen (that I sold to fund my Nakaya) that I had carried for a bit with no issues at all. Overall, the VP is holding up very well, especially when considering the amount of usage it has gotten and the numerous amount of times I’ve carried it in-pocket, sans-case. 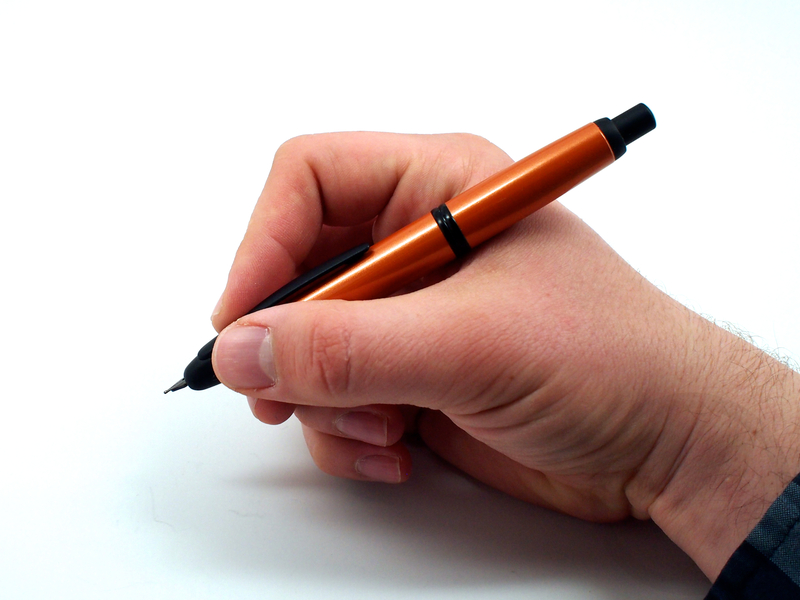 Have you ever gotten a nice new pen, inked it up, used it for a week straight, the shelved it for the foreseeable future? I have. Several times. Once again, this isn’t the case with the Vanishing Point. 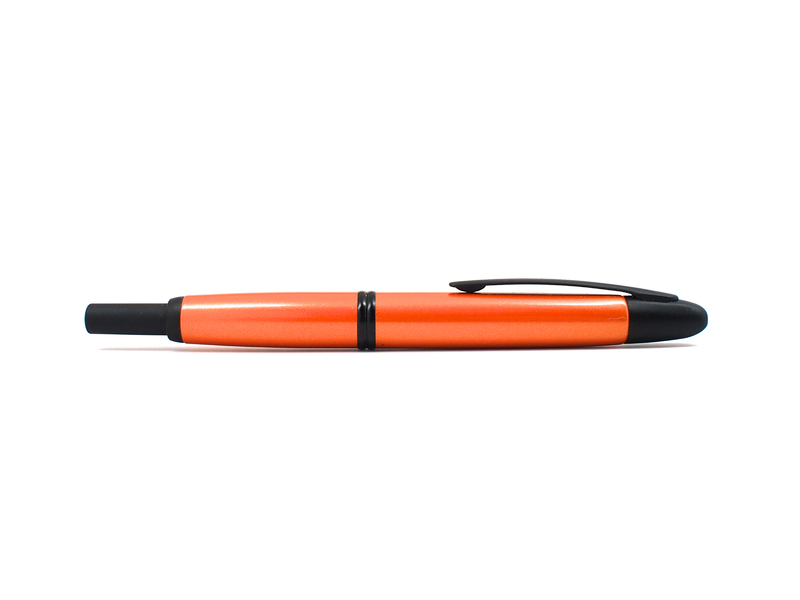 The VP is a great pen for both quick notes and longer writing sessions. The pen was absolutely perfect for college lecture notes. 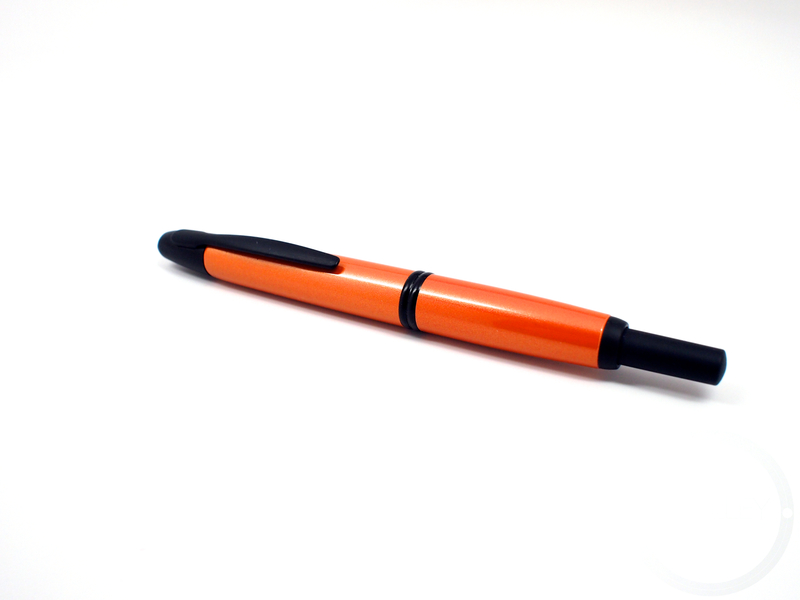 Not having to worry about keeping track of a pen cap is more convenient than you may think. Especially so when moving between classes – there’s nothing to leave behind or drop on the floor. There’s a very good chance that I have a VP inked at all times, and when I don’t, I wish that I did. The pen definitely gets enough usage to justify the ~$140 price tag! The Vanishing Point is a solid addition to any pen collection that I will continue to use and love. I have no doubts that my 2.5 year old VP will continue to serve me well for many more years to come. I’m also happy to report that the new stock medium nib is a much better performer than my old fine nib too. I’ve had 3 VPs in my collection, but only two remain. Like I said before, the only reason I parted with one was to fund a larger pen purchase, and it wasn’t easy parting ways. I would love to hear your feedback on these new follow up reviews as well! Thanks again to Deborah over at Pilot Pens for sending me over this awesome new VP! Recommendation: Yes! The Vanishing Point has held up to years of heavy use, and continues to be one of my most reached for pens. 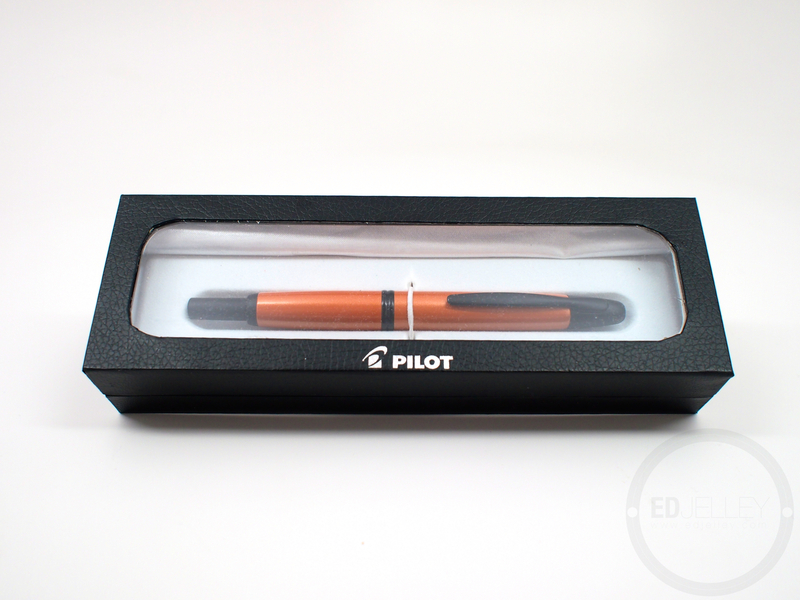 Disclaimer: I received this pen free of charge from Pilot for review purposes. However, it does not have any effect on my feelings and thoughts about the pen. The metallic orange and black combo is awesome! I have had my VP for maybe 4 years now and it’s a tank. I definitely like the long-term test follow up idea. Follow-ups are an excellent idea! One question about the VP: How long can it remain idle (full of ink but not used) and still flow well when you first write with it? I’m wondering if the fact that it is never capped (even though the nib gets retracted) dries out the feed faster? I haven’t had any issues to report. Worst case scenario is to advance the piston converter a bit to get it started. Surprisingly it usually starts back up. Maybe I’ll leave one unused for a week, for science of course! I think you’ve sold me again Ed. I’ve the matt black one too and it’s my daily work carry with a factory medium that’s as smooth as glass. I did pick up a black medium unit recently to add yet more stealthiness and it’s in need of some smoothing as it’s a bit scratchy, not sure if this is indicative of the new finish or not. With a could of years of use it’s still in good condition with no brassing but I’ve been very aware of keeping it away from other metal items. I think I’ll end up swapping my silver one for an orange now. I wish I would have gotten the green one. Every time I see a picture I see of it, I get jealous. I found the stock rhodium fine to be much scratchier than the black plated one. I’m sure they all vary slightly, as that seems to be the nature of the beast.